The journal Comunicación y Hombre boasts an Editorial Board made up of 38 researchers from Spain and other countries, who are experts in their various fields, and a Journalistic Board of 14 doctorate researchers. 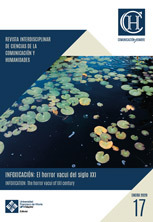 The journal Comunicación y Hombre publishes articles orientated towards the promotion and development of knowledge concerning communication, as an area of reflection and dissemination of research that has been carried out in the Communication Sciences field, taking as a reference the fundamentals of integral humanism. Our objective is to always seek the truth and a common ground of wisdom and dialogue. The journal is dedicated to publishing research results which are original. The Journalistic Board is tasked with deciding what the theme for each issue is to be, based on criteria including social interest and scientific and related production. It also decides in which issue each article is to be published and assesses those cases that may suppose an anomaly which needs an informed decision to be taken. The Board also ensures the implementation of the code of ethics and the mission, vision and values of the journal, guaranteeing the constant adherence to principles of rigour and research quality. They also take decisions regarding possible changes in the development of the publication. The Review Committee uses a double blind review system, once the Journalistic Board has deemed that an article complies with the rules and norms for publication and has passed the first tests to ensure the absence of plagiarism. The journal Comunicación y Hombre publishes its organizational chart, its Council members, Board of Directors, the rules of publication, its ethical code as well as the procedure required for publication, the time frames and other useful information such as quality criteria and its open policies, on the web. The journal “Comunicación y Hombre” is committed to its evaluation system and to maintaining the deadlines for the reception, revision, evaluation and publication of its articles. The peer review system guarantees that only a qualified specialist will be asked to evaluate the article, with the relevant doctoral studies. The authors will be informed at all times of the first revision process and the dates set for first acceptance or rejection (maximum 30 days) and the subsequent review process and its deadlines for acceptance or otherwise (maximum 150 days). Edition of the articles is by means of preprint (digital text not yet reviewed) and subsequently published in paper. From 2017, there will be two issues every year. The journal is committed to ensuring this frequency and to the publication procedure deadlines. Said commitment is of vital importance, both in order to be able to adhere to the publication dates set, as well as guaranteeing the right of the authors to have their articles processed as quickly as possible and to be informed at all times of the point at which the article finds itself in the complete process. The journal Comunicación y Hombre is committed to its evaluation system and to maintaining the deadlines for the reception, revision, evaluation and publication of its articles. 1 The theme for the new issue is decided upon by the journal’s director and the Journalistic Board, based on criteria concerning what is of interest in the field of communication. 2 Articles are received and a first revision is carried out, in line with the journal’s rules and norms for publication, followed by a first anti-plagiarism check. 3 Reviewers are selected based on their expertise regarding the theme chosen, in order to ensure review quality: the selection procedure is overseen by the editor and by the national and international university professors and researchers of the Editorial Board. The number of reviewers is increased every year in order to guarantee the ability to review each speciality by pairs. 4 The author’s name and institution is removed from the article and sent to the reviewer, who also remains anonymous (the double-blind system): To preserve the integrity of the double-blind peer review process, the authors will not be told of the reviewers’ identity, nor the reviewers the author’s. 5 The reviewer receives the article and ensures that the content is in line with the publication and scientific quality requirements of the journal Comunicación y Hombre. 6 The reviewer, by means of the journal’s web site area reserved for this purpose from 2017 onwards, using the OJS platform, proposes suggested changes, modifications and inclusions to the author. Subsequently, the reviewer completes a form with the relevant information regarding the article and, after the possible changes made by the author, will give his or her verdict, within the established time limits. This evaluation form will always remain in anonymity and all suggestions that is contains are communicated to the author by means of the journal secretary. 7 The work area reserved for the publication procedure of the journal has been designed to record all the exchanges between the editor and the reviewers, as well as all the evaluation comments made in the forms, and is kept in electronic storage within the restricted area of the journal. This allows the journal Comunicación y Hombre to maintain its quality and transparency policy throughout the procedures adopted. It also permits the possibility of being evaluated by the accredited external institutions and evaluators, who may request for the password from the journal’s director in order to access the restricted area and verify the real use of the evaluation system employed by Comunicación y Hombre. 8 The reviewers must communicate their evaluation exclusively by means of the evaluation forms. The model may be found within the restricted area of the journal’s web site. The evaluation form has a part with a score scheme of 1 to 5 points regarding criteria of originality, methodological rigour, relevance for readers, correct use of language and content structure. There is also a qualitative part to the form where remarks concerning analysis and discourse and the strengths and weaknesses of the article may be made. In a third part of the form, a synthetic judgement is made of the article as to whether or not the article is publishable or publishable with reservations. In this last case, the reviewer must offer indications or suggestions to the author, with the aim of improving the article so as to ensure quality. The evaluation form format is available to the authors, so that the evaluation criteria is clear and transparent to them.